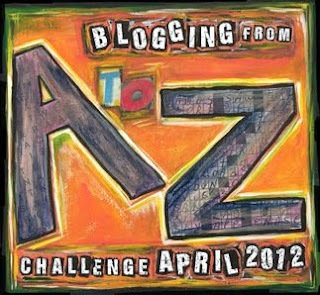 I don't even remember how I found this blogging challenge but I thought it would be fun to try. It would get me writing more and thinking about blogging in a different way. I haven't been consistent at all with my posts so this will truly be a challenge! Ideas are plentiful but the time and motivation to flesh them out has been lacking lately. Hopefully this will get me back into the habit! Since this blog has no clear direction, I'm not sure what's going to happen during April with the topics. My initial plan is to do "an evening in" kind of theme where I suggest wine, cheese and fruit combinations along with a book, movie or music album. An evening of alliteration, if you will. Some letters will be much more difficult than others! But that's the case with any topic. Maybe I'll start with that plan and be open to change if it's not working out. We shall see. 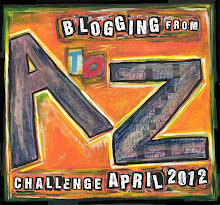 April 01, Sunday - Letter "A"
April 02, Monday - Letter "B"
April 03, Tuesday - Letter "C"
April 04, Wednesday - Letter "D"
April 05, Thursday - Letter "E"
April 06, Friday - Letter "F"
April 07, Saturday - Letter "G"
April 09, Monday - Letter "H"
April 10, Tuesday - Letter "I"
April 11, Wednesday - Letter "J"
April 12, Thursday - Letter "K"
April 13, Friday - Letter "L"
April 14, Saturday - Letter "M"
April 16, Monday - Letter "N"
April 17, Tuesday - Letter "O"
April 18, Wednesday - Letter "P"
April 19, Thursday - Letter "Q"
April 20, Friday - Letter "R"
April 21, Saturday - Letter "S"
April 23, Monday - Letter "T"
April 24, Tuesday - Letter "U"
April 25, Wednesday - Letter "V"
April 26, Thursday - Letter "W"
April 27, Friday - Letter "X"
April 28, Saturday - Letter "Y"
April 30, Monday - Letter "Z"
This looks interesting. I may give that a shot too. I signed up too. I don't know what I was thinking, since I can't even keep up with a once-a-week schedule. Good luck to both of us! Best of luck to all bloggers involved! I'm looking forward to doing it, too! Good luck!